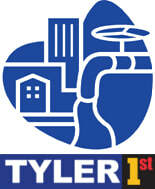 The Tyler Water Utility supplies water and sewer services to most of the area within the current city limits. The utility is an enterprise fund that pays for operations, maintenance, and approximately $4 to $6 million in annual capital improvements from fees and service payments. Drinking water supplied by Lake Tyler, Lake Tyler East, and Lake Palestine. 50,000 square foot building at 201 South College Avenue. Circulation of over 222,000 items including books, videos/DVDs, magazines, newspapers, music, and special collections on genealogy and local and regional history. Largest municipal-owned rose garden in the United States (14 acres). Contains over 20,000 roses representing more than 300 species. The Harvey Hall Convention Center includes 30,000 square feet of meeting rooms and activity space. The Rose Garden Center includes 10,000 square feet of meeting rooms and activity space. Tyler residents generally are pleased with municipal services. The water/sewer utility and the solid waste department operate as enterprise funds. A stormwater utility has been initiated with plans to comply with implementation of EPA Phase II Stormwater Regulations. The City has planned ahead to assure its drinking water supply for many decades to come. The City has planned ahead to assure landfill space for over 100 years at current rates of usage. The City is working to address code enforcement concerns with additional resources.